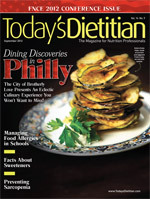 Organization and planning helps RDs provide nutritious meals for students while protecting those with food allergies. Billy is in first grade and excited about his school’s field day. He and his classmates are each handed a boxed lunch and told to find a spot in the grass to eat before the games resume. The students spread out and begin to unpack their lunches on the lawn. Billy enthusiastically eats his ham and cheese sandwich, apple, cookie, and milk. As he’s laughing and talking with his friends, he suddenly begins to feel sick. His mouth feels a little tingly, and his stomach begins to ache. Billy finds his teacher and tells her he’s not feeling well. Remembering Billy has a food allergy, she calls over her coteacher and asks him to take Billy to see the nurse. As they walk to the nurse’s office, Billy turns pale. When they arrive, the nurse immediately recognizes the signs of a serious allergic reaction and administers emergency epinephrine while the teacher dials 911. What caused Billy’s reaction? Could anything have been done to prevent it? What would you have done in this situation? Is your school ready for a student’s potentially life-threatening allergic reaction? If you’re a foodservice director or work with schools and are unsure of your response, it’s urgent that you prepare to manage food allergies in your schools. Between 2007 and 2010, it is estimated that between 3.9% and 8% of children were found to have food allergies.1,2 This translates to more than 3 million children.1 Between 1997 and 2010, food allergies increased by 18% in children under the age of 18.1 Unfortunately, no one knows why cases of food allergies have increased. It’s difficult to determine the true prevalence of food allergies because many are self-reported without medical diagnosis. In fact, research shows 50% to 90% of people who self-diagnose a food allergy are wrong.7 Because the symptoms are similar, intolerances or food sensitivities may be misdiagnosed as a food allergy. Diagnosis should be made by a board-certified allergist and include a detailed history, blood and/or skin prick testing, and oral food challenge whenever possible. History and blood or skin tests alone are not adequate to diagnose food allergy, and many tests have high false-positive rates. An oral food challenge is considered the gold standard of diagnosis and should be conducted only in a safe environment with medical personnel and emergency medication at the ready, since it includes giving small and increasing amounts of the food over the course of a visit. Oral food challenges may not be necessary or are contraindicated when very severe or life-threatening reactions have occurred. Some foods less likely to cause allergic reactions include citrus, strawberries, sesame, and celery, but any food has the potential to cause a serious reaction. Celiac disease isn’t a food allergy, but incidents of this autoimmune disease have risen over the past several years, and it’s becoming more common for students to request gluten-free meals as well as guarantees against cross-contact with potential gluten-containing foods. The National Institutes of Allergy and Infectious Disease (NIAID) convened a panel of experts representing more than 30 organizations, including the Academy of Nutrition and Dietetics, as well as parents and individuals with food allergies, to create comprehensive recommendations for the United States. The resulting guidelines represent the consensus or opinions of the leading experts in food allergy definitions and management and contain an exhaustive bibliography. Although the guidelines don’t address managing food allergies in schools, foodservice, or other areas per se, they provide a rich foundation for understanding food allergies. Published companions include a summary for clinicians and one for patients and families. It’s not possible, or necessary, to state the entirety of the guidelines here, but nutrition professionals working to manage food allergies would benefit from a thorough review. Evidence doesn’t support restricting potential food allergens during pregnancy or lactation as a strategy to prevent food allergies, according to a 2008 report by the American Academy of Pediatrics.8 Research is under way to determine the effect of the timing of the introduction of solid foods, especially potential food allergens, on the development of food allergy in infants. Researchers have found that breast-feeding has many positive nutritional and health benefits but doesn’t seem to provide protection against the development of food allergy. Going to school can have its own unique set of challenges for children with severe food allergies. A survey of families showed that nearly one in four children with food allergies has been the victim of bullying because of the food allergy.9 Bullying may include teasing, taunting, physical harassment, and other forms of intimidation, including threatening an allergic child with the potential allergen. There also have been documented cases of hazing involving allergens. Moreover, children with food allergies have higher rates of asthma and other allergies, making an allergic reaction especially dangerous. Because they impact a major life activity (eating), severe food allergies are considered a disability covered under the Americans With Disabilities Act, and schools must be willing to make reasonable accommodations. In addition to the children’s anxiety, parents or caregivers can feel anxious and fearful because they can no longer control all the food children may eat. They may worry that the school staff will fail to take the allergy seriously or will be unprepared in case of accidental ingestion. Nutrition professionals can play a pivotal role in helping children with food allergies eat a nutritious diet at school with as little restriction as possible while keeping them safe. They must give careful consideration to meal planning, training and monitoring of foodservice staff, and the prevention of cross-contamination. Dietitians are uniquely trained to help provide guidance, including cutting through misinformation and calming fears to make evidence-based recommendations for food allergy management. • The student is responsible for not sharing food or eating food with unknown ingredients. • Parents are responsible for providing appropriate medical documentation and emergency medication. • Schools are responsible for providing a safe environment, training staff, and providing reasonable accommodations. It’s essential for school staff to work with parents and students as a team to reduce risk and create an allergy action plan in case of accidental ingestion. Accommodating food allergies in the school setting can seem like a daunting task, but it’s attainable. With good planning and the right precautions, schools can be a place where students learn to manage their food allergies with a safety net in place. As long as nutrition professionals in foodservice take a proactive stance on managing food allergies, families and students will feel confident. • Build a team that includes the foodservice director, supervisor, and/or manager; school nurse; administrators; teachers; parents; and students. Know your department’s, school’s, or district’s policy on managing food allergies. If there’s not a clear policy, develop one. • Minimize the risk of cross-contamination. Nearly every step in a Hazard Analysis and Critical Control Points plan has a built-in opportunity for managing food allergies. Use a flow-of-food diagram to identify critical control points for managing food allergies along with food safety. • Teach and reinforce good hand washing and glove change procedures for staff and students. Soap and water are best for removing allergenic proteins. Liquid sanitizers don’t remove these proteins. • Use separate utensils for the preparation and service of every dish and item. • Label all potential allergens clearly in storage and on the serving line. • Store potential food allergens to lower the risk of cross-contamination (eg, store ranch dressing below ready-to-serve fruit in the refrigerator). • Consider preparing potentially allergenic foods at the end of preparation time in a designated area. • Clean tables with separate wash buckets and disposable cloths. • Train and retrain staff on decreasing the risk of cross-contamination, identifying food allergies and food allergy reactions, and how to administer emergency medication. • Make ingredient and recipe information available to families and students. Whether in writing at the district’s central office or on a school’s website, making the information available to families maintains transparency that earns trust. With organization and planning, food allergy problems can be minimized and healthful meals delivered to every student. — Sherry Coleman Collins, MS, RD, LD, has worked in clinical pediatrics and school foodservice, where she gained hands-on experience working with students, families, and staff to manage food allergies. She is currently the senior manager of marketing and communications for the National Peanut Board. • Food Allergy and Anaphylaxis Network (FAAN) School Foodservice Guidelines, available at www.foodallergy.org. • The School Nutrition Association has training available to members on their School Nutrition University website (www.snuniversity.org) as well as archives to webinars on demand and a food allergy resource page (www.schoolnutrition.org/Content.aspx?id=17241). • AllergyReady.com is an online training for nonhealthcare school personnel developed by FAAN and the Food Allergy Initiative. • The Culinary Institute of America’s ProChef Series includes a free resource called “Food Allergies, Sensitivities & Dietary Restrictions: Challenges & Opportunities for Food Service,” to help foodservice professionals understand how to manage food allergies in their establishments. It is available at www.ciaprochef.com/foodallergies. 1. Branum AM, Lukacs SL. Food allergy among U.S. children: trends in prevalence and hospitalizations. NCHS Data Brief. 2008;(10):1-8. 2. Allergy statistics. American Academy of Allergy, Asthma, and Immunology website. http://www.aaaai.org/about-the-aaaai/newsroom/allergy-statistics.aspx - Food_Allergy. Accessed June 25, 2012. 3. Food allergies: what you need to know. US Food and Drug Administration website. http://www.fda.gov/food/resourcesforyou/consumers/ucm079311.htm. Last updated May 14, 2012. Accessed June 25, 2012. 4. Anaphylaxis and food allergy: nutritional considerations. NutritionMD.org website. http://www.nutritionmd.org/consumers/howto_allergy/food_allergy_nutrition.html?print=1. 2012. Accessed July 30, 2012. 5.Tree nut allergy. American College of Allergy, Asthma, and Immunology website. http://www.acaai.org/allergist/allergies/Types?food-allergies/types/Pages/tree-nut-allergy.aspx. Accessed July 30, 2012. 6. Gupta RS, Springston EE, Warrier MR, et al. The prevalence, severity, and distribution of childhood food allergy in the United States. Pediatrics. 2011;128(1):e9-17. 7. NIAID-Sponsored Expert Panel, Boyce JA, Assa’ad A, et al. Guidelines for the diagnosis and management of food allergy in the United States: report of the NIAID-sponsored expert panel. J Allergy Clin Immunol. 2010;126(6 Suppl):S1-58. 8. Greer FR, Sicherer SH, Burks AW; American Academy of Pediatrics Committee on Nutrition; American Academy of Pediatrics Section on Allergy and Immunology. Effects of early nutritional interventions on the development of atopic disease in infants and children: the role of maternal dietary restriction, breastfeeding, timing of introduction of complementary foods, and hydrolyzed formulas. Pediatrics. 2008;121(1):183-191. 9. Lieberman JA, Weiss C, Furlong TJ, Sicherer M, Sicherer SH. Bullying among pediatric patients with food allergy. Ann Allergy Asthma Immunol. 2010;105(4):282-286.